Theresa May and Jeremy Corbyn warmed up for their long-awaited meeting to discuss the way ahead on Brexit by clashing in the House of Commons. 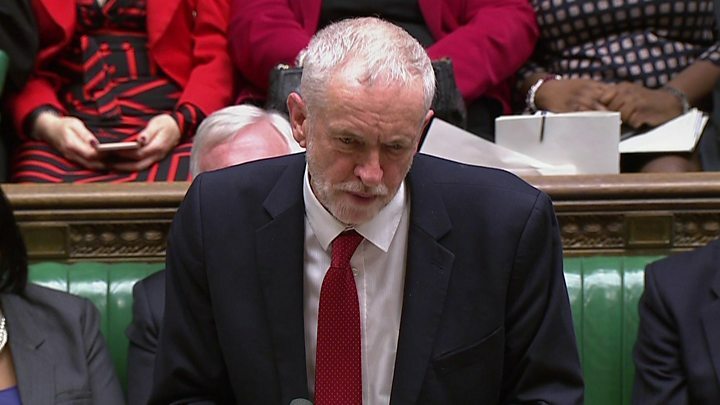 At Prime Minister’s Questions the Labour leader repeatedly urged Mrs May to rule out a no-deal Brexit and to ditch her “red lines” in any upcoming talks with Brussels. Mrs May hit back by saying that Mr Corbyn “has no plan for Brexit”. The pair later met privately to seek common ground on Brexit. The meeting, in the prime minister’s Commons office, lasted 45 minutes. ▪ What time will Brexit votes be? What are MPs voting on? Mr Corbyn agreed to the meeting after MPs voted against the idea of a no-deal Brexit on Tuesday evening. He had previously ruled out such a meeting unless Mrs May ruled out a no-deal Brexit herself. At PMQs, he said the prime minister may have succeeded in “temporarily uniting her very divided party” in Tuesday’s votes on amendments to her plan but she had to make “more important compromises” to “unite the country”. Mrs May said Mr Corbyn was a “fine one to talk about coming together”, when he had only now agreed to meet her. She said the majority of MPs had identified the Irish backstop as the main sticking point preventing them from backing her deal, whereas Mr Corbyn’s Brexit proposals had been rejected. “He has no plan for Brexit, no good plan for our economy and no plan for our country,” she told MPs. But the PM received a stark warning from Dublin over her future plans for the backstop. 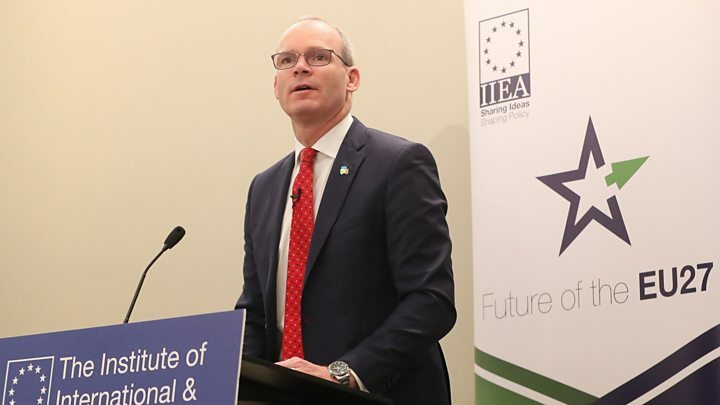 Simon Coveney, Ireland’s deputy prime minister, said anyone who allowed the “borders and divisions of the past” to return will be “judged harshly in history, and rightly so”. MPs voted 317 to 301 in favour of changing the backstop plan – the section of Mrs May’s deal with the EU designed to avoid the return of Northern Ireland border checks. Five amendments, including Labour MP Yvette Cooper’s bid to delay Brexit if Mrs May does not get her deal through Parliament, were defeated on Tuesday. Mr Corbyn asked Mrs May whether, if she did not agree a deal with Brussels that MPs would support, she would back Labour’s proposals for a “a strong single market, comprehensive customs union and the guaranteeing of rights and protections rather than the alternative she has been threatening – to crash out with no-deal”. It was a message she repeated to Labour MP Jack Dromey, who together with Tory MP Caroline Spelman got MPs to back a non-binding amendment rejecting a no-deal Brexit on Tuesday. How did my MP vote on 29 January? Enter a postcode, or the name or constituency of your MPType in 2 or more characters for results. Later in the session, Nigel Dodds, leader of the Northern Ireland’s Democratic Unionist Party at Westminster, described remarks by the Irish Foreign Minister Simon Coveney on the UK’s approach to Brexit as “highly reckless and extremely dangerous”. Mr Coveney likened the UK’s negotiating stance to “either you give me what I want or I’m jumping out the window”. Mr Dodds said that kind of rhetoric needed “to be toned down”. Mrs May said she will speak to Irish premier Leo Varadkar later on Wednesday. “It is important for us to work with the Irish government on the arrangements that will be in place in the future,” she added. But ahead of the call, Mr Varadkar told the Irish Parliament that the EU stood by the withdrawal agreement and renegotiation was not on the table. At the moment, the UK is due to leave the European Union at 23:00 GMT on 29 March, with or without a deal. The UK and the EU negotiated their withdrawal agreement deal over the past 18 months but it needs to be backed by MPs for it to come into force. Earlier this month MPs voted against the plan Mrs May had proposed by 432 votes to 202. Mrs May said that, after taking Tuesday’s votes into account and talking to the EU, any revised deal would be brought back to the Commons “as soon as possible” for a second “meaningful vote”. After a public shout out of “No way!” to renegotiating the Brexit backstop/withdrawal agreement, the EU now waits for Theresa May to come to Brussels. Parliament appeared to lob the ball back in the EU’s court last night, by uniting(ish) around a request for alternatives to the backstop but the EU is preparing to send the ball back pronto, with the question to the prime minister: Your negotiators and ours failed after 18 months to come up with a better bilaterally acceptable Irish border guarantee so what concrete alternative do you have worked out? Expect the EU to stand firm for now and for some uncomfortable days ahead. 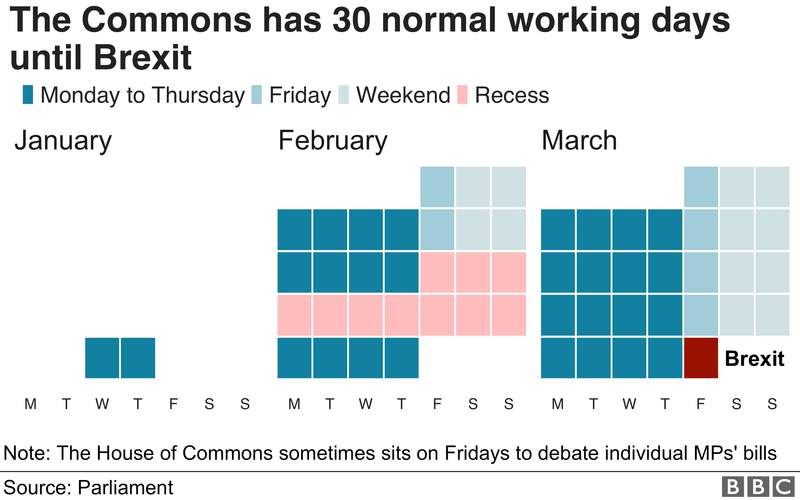 Brussels’ deadline is 29 March, whereas the prime minister has a self-imposed a deadline of mid-February when she says she wants to hold another parliamentary vote on the Brexit deal. Brussels won’t rush to help her with that one. EU diplomats tell me she has to be more realistic. They don’t want to budge on core backstop principles so no unilateral exit mechanism to the backstop is likely for the UK. The EU intends to stonewall Theresa May until “the message is driven home”, I’m told. As it stands, the backstop would effectively keep the UK inside the EU’s customs union, but with Northern Ireland also conforming to some rules of the single market. It was one of the main reasons Mrs May’s Brexit deal was voted down in Parliament by an historic margin earlier in January as critics say a different status for Northern Ireland could threaten the existence of the UK and fear that the backstop could become permanent. These include a “trusted trader” scheme to avoid physical checks on goods flowing through the border, “mutual recognition” of rules with the EU and “technological” solutions. She also wants to discuss a time limit on the backstop and a “unilateral exit” mechanism – both options ruled out by the EU in the past. She has also promised the government will “redouble its efforts to get a deal this House can support”.